The Cultural Evolution! - Transforming culture from the inside out. So, how do you transform a culture to meet your school's needs today? How can you get staff or teams to behave the way you need them to execute your strategies and enhance the education of our young people as well as your staff engagement? How do you get the innovation and agility you need in the fast-changing world of education? How do you get the cross-organisational collaboration that makes one plus one equal three? Transforming culture means changing people! You can do that only by improving the behaviors of people. That’s because culture is nothing more than the collective beliefs and habits of the people in an organisation. So in the end, you can only transform cultures by facilitating personal transformation in people. Herein lies the challenge: Cultures tend to resist what they most need to change because people resist changing life-long habits and beliefs that are an engrained part of their personal and professional lives. 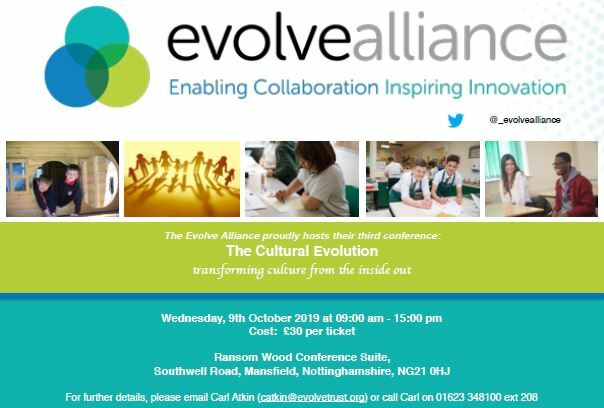 This year's conference promises to explore the challenges of transforming culture from the inside out with confirmed speakers so far including Dr. Ben Laker and Jonathan Newport. Book now to avoid disappointment!